Learn 1 Year Of Math In 3 Months. We guarantee your child will learn at least 1 year of math in 3 months when they use our system 30 minutes per week. Ethan Learned 4 Years of Math in Just 3 Months. 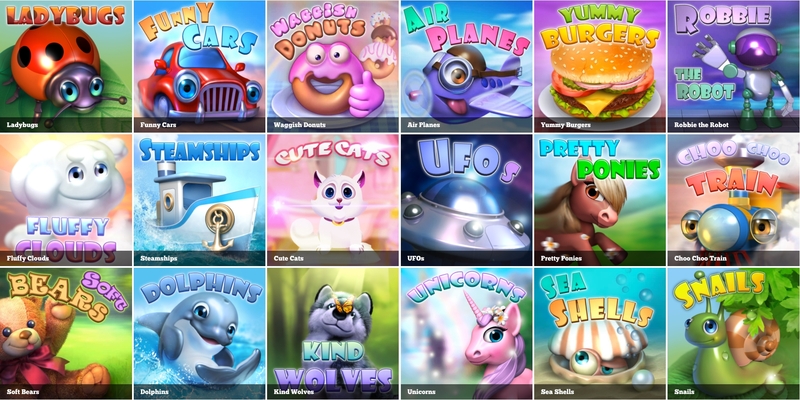 Our growing library of activities and characters challenge and entertain while providing ACCELERATED learning! Our algorithms quickly detect what your child understands and does not understand. We use that information to provide activities that are proven to teach mathematical concepts. 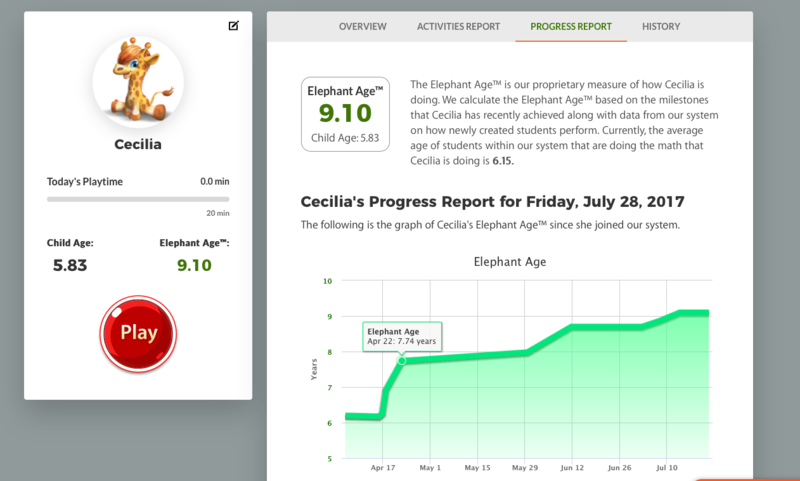 We provide you with real-time reports that let you know exactly what your children are working on. You'll also get parental advice on how to take those same concepts outside of the app so that they may learn them in the real world in context through play. It is like having a University professor teach your children math. At anytime, if you need advice or help, let us know. We will step in and guide you. 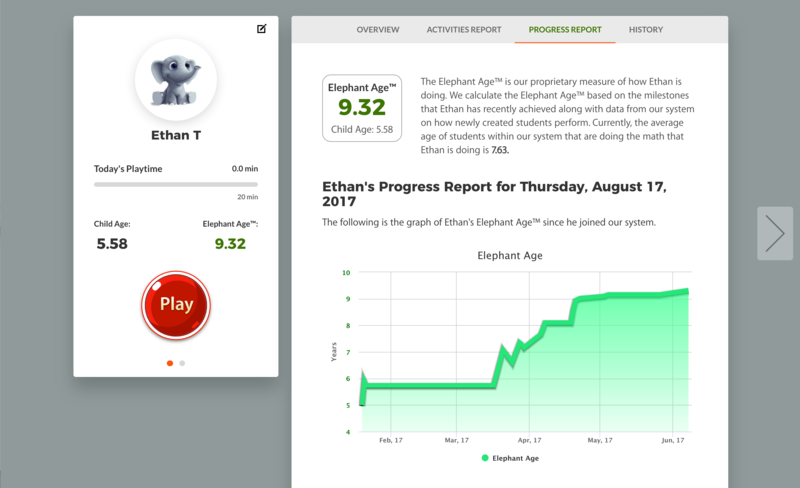 Elephant Learning is 100% compatible with all school curriculums because we focus on concepts rather than procedures, thereby enhancing the classroom experience. "This is by far one of the best apps we have seen. It is clear that the developers have an in-depth understanding of how Math should be taught. We believe that this could be the basis of mathematical learning for the future and that is why it has been awarded our five-star rating." Tuition is $35/month and covers up to 3 students. More students are available upon request after enrollment. Scholarships are available and awarded based upon merit via our partners at Math Matters. To apply for a scholarship, simply fill out the short application while enrolling. A scholarship may lower the tuition from $35/month to as low as $10/month. Learned 1.6 years of Math! My daughter always enjoys spending time with Elephant Learning. She always liked math until switching to a new school when she no longer felt challenged. Elephant learning keeps her growing at her own pace and she has fun with it again. After just a few months she was able to learn 1.6 years of math. I like the way it has been deepening her understanding of number relationships. She's well into the algebra curriculum and I'm glad she has the opportunity to develop her own understanding independently. Both of my children have learned so much! I’m so thankful for this program. Thank you so much!!!! We got the opportunity to include it on our curriculum this coming year. My daughter has only been using for a few weeks and has improved by over 2 years! It’s amazing. I fully recommend to anyone!! She is learning fractions! AND she understands it. I enjoy that my 3 year old is learning while playing. I enjoy that my 3 year old is learning while playing. Although she has a hard time understanding some of the instructors accents when they give instructions. To me the games seem redundant but she enjoys the wacky sounds and animations. I do really like that I can see her progress and what she needs to work on along with activites we can go together to strengthen her skills. Her pediatrician recommended a math program because so many female students struggle and even nowadays people need calculators to do simple math. Thanks for making this program accessible for low income families. Both Children Learned Years Of Math! 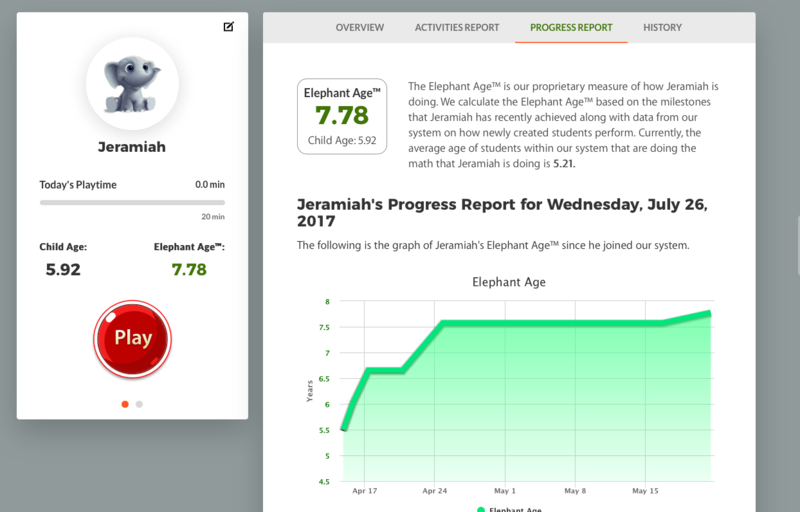 Elephant Learning assigns a math understanding age, rather than a grade level. Our 5 year old now has a math age of 7.5 years and our 8 year old is at nearly 11. They are home schooled, so boredom is not an issue. We work within common core, but they also do supplemental math work. Elephant Learning has been very beneficial for our sons. They have learned such a great deal in a short amount of time. The app is easy to use, even for my three year old. The only suggestion I have is to make the voices less robotic sounding and differentiate the activities a bit. 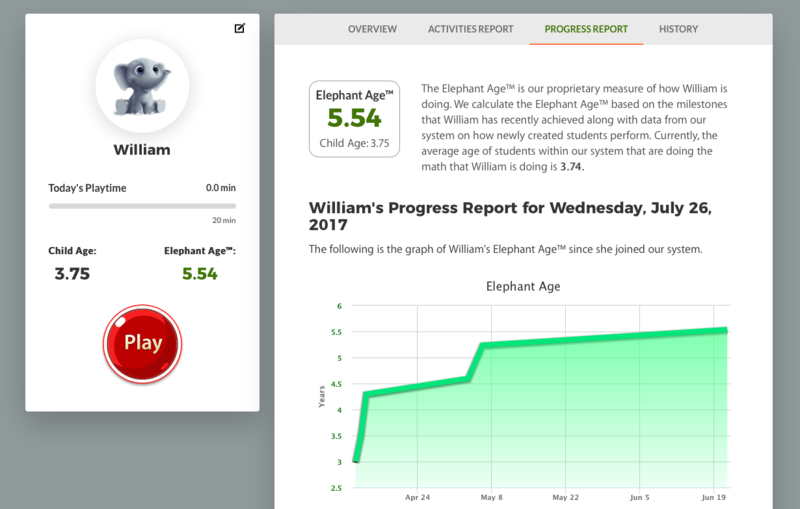 I purchased this app for my 8yr who was struggling with math and also signed up my 5yr (pre-k) since the app allows 3 users. My 8 year old has gained skills and confidence and enjoys playing. My 5yr old has made even more significant gains and will be ahead of the game for kindergarten in the fall (more than a year in less than 3mo). More than that, whenever I have had any questions about the app, the support team has been highly responsive. My kids are loving this and learning so well. They were already ahead in math for their age and I wanted something that would see where they were and adapt to it. This does exactly that and my kids are really enjoying that it challenges them where they are. ? We do mini lessons in conjunction with the app if they need extra explanation but I love that the problems are all math they can SEE as it’s helping them “move the objects” in their head better too! My Son and Daughter Are Learning At An Unbelievable Rate! We absolutely love Elephant Learning! Both my son (5) and my daughter (3.8) are learning math at an unbelievable rate! My 3.8 year old only have been on the program for 1 month and spends maybe 45 mins a week and has now the understanding of a 5.3 years old! It's amazing when the child believe they are just playing a game but they are actually learning math concepts. Brilliant. I can't take the tablet away from my kids! William is a 3 year old that is just entering first grade math. In less than 3 months, we took him from counting to addition and subtraction. Now that William will understand the teacher and curriculum coming into school, he will not have any issues keeping up in class. Staying within our system, William will be introduced to concepts typically reserved for older children. The sooner he understands them, the sooner he can move on to more complex topics such as writing code or understanding physics. We are so proud of Cecilia! She learned over 3 years of math with us. Cecilia started in our system at kindergarten level math, and she is now multiplying, dividing, and working with fractions. Ethan started counting with us, and within several months, he made his way to fractions. Ethan learned 4 years of math with us. Best of all, he used the system just 45 minutes per week! Jeremiah started in our system with understanding two-digit numbers. In just the spring quarter, he was able to progress to early multiplication and division. Jeremiah learned over two years of math with us! 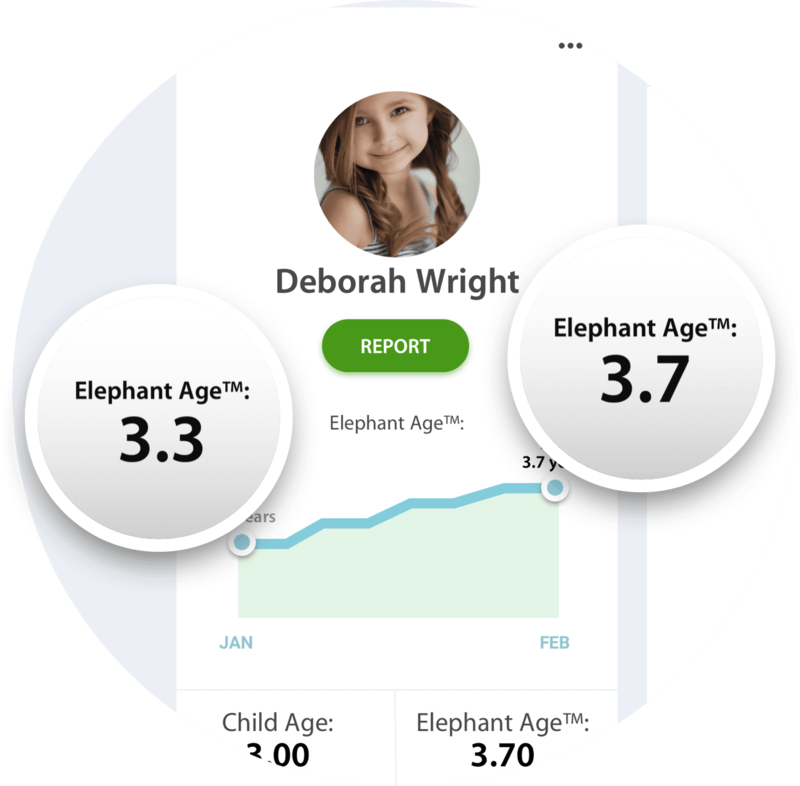 Our accurate reporting gives your child a "real" math age. With this simple metric, we are able to give you accurate reports up to the second.